Augmented Reality (AR) has the power to change the way we look at things. Although AR was introduced years ago via Google Glass, that didn’t work out for consumers. People finally got on board with AR via Pokémon Go in 2016. However, we haven’t seen a plethora of AR applications for android and iOS flooding the app stores — until now. Last summer, Apple announced ARKit and this year, Google announced the release of more than 60 new AR apps in its Android Play store. 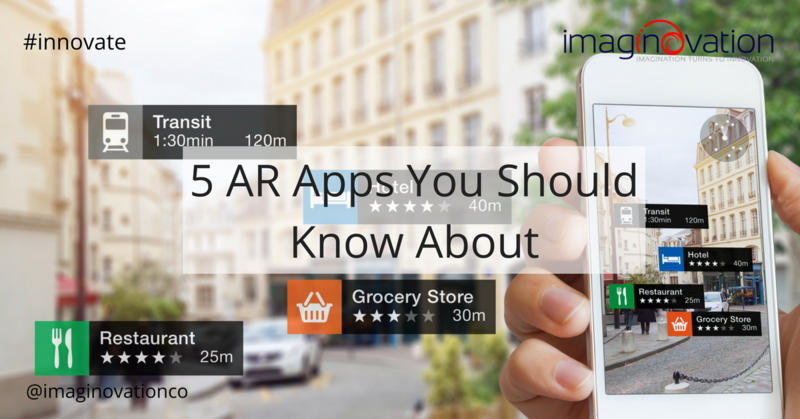 While 60 isn’t a lot, both events are a noteworthy jump as AR becomes increasingly available and adopted by the masses. Augmented reality (AR) is an enhanced version of reality, creating the illusion that virtual objects are in the same space as real, physical objects by overlapping them via your smartphone or tablet. Unlike virtual reality (VR), in which you need a headset to enter a fabricated world, AR relies on your current devices, such as smartphones or tablets, making it more accessible and affordable. My Tamagotchi Forever – Many people are talking about this one, mostly those who remember carrying around Tamagotchis in junior high. The game lets you raise your own pet Tamagotchi. If you didn’t have one of these keychains 20 years ago, it’s critical to know that you must feed and water your pet, bathe it, and keep it entertained. The AR feature takes the experience to a new level, giving you the chance to meet other Tamagotchi friends, find hidden things in the real world, collect treasure, and build your own Tamatown. Walking Dead Our World – If you’re a Walking Dead fan, here is your chance to fight zombies in real time, sort of like catching Pokemon. The game is still in pre-registration. If you’re eager to shoot some zombies now, try Zombie GO instead. Similarly, Ghostbusters World will be out sometime in 2018, a chance to pick up a proton pack in your hometown. Field Trip – Gain some new insights about your commute to work by learning something about the place around you. No clicking necessary; when you get close to something interesting, the app pops up a card with details about the location. Information might be about shopping, but also history, fun facts, and more. Pottery Barn 3D Room View – This is another app getting a lot of chatter, probably because it’s useful. Hold up your phone or tablet to scan your room and then place furniture in it to see how it looks. Of course, you’ll be placing Pottery Barn furniture in the room, but it’s a useful way to get a sense of color schemes and space without measuring and heading out to eight furniture stores. Similar apps are Amikasa (iOS only) and the IKEA catalog. WallaMe – Available in both Android and iOS 11, this app gives you free reign to draw on the world. You can tag the locations so that others can see the pictures or make them public for the world to see as they walk by. Enjoy the hunt of searching for other people’s public art as well. If you’re curious about how AR apps for android and iOS can be part of your next business app, talk to us about making your idea an augmented reality.